[Toronto] A team of astronomers has identified a group of stars overtaking the Sun in its orbit around the Milky Way Galaxy. The stars are further from the Galaxy’s centre than the Sun and are passing us like runners lapping a slower runner in an inside lane. 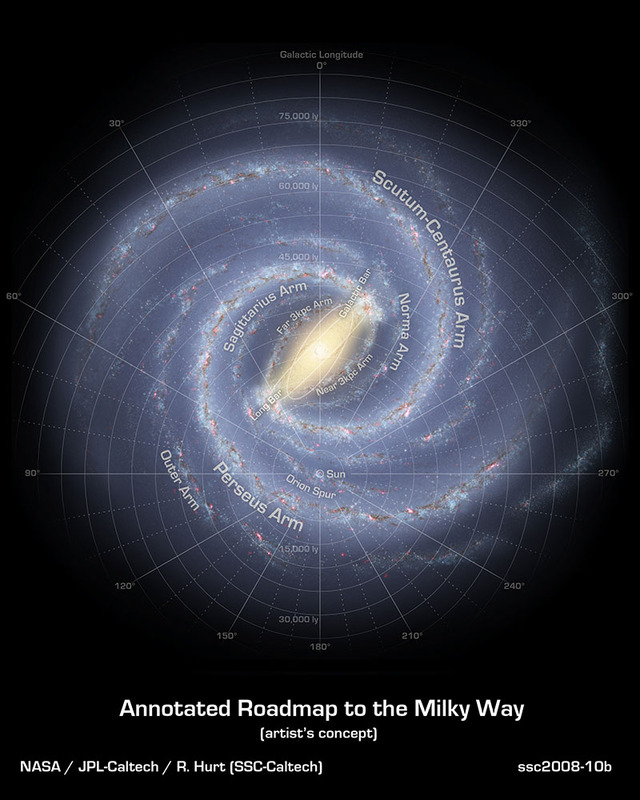 The discovery provides evidence for a theory describing the nature of galactic spiral arms—a theory that predicts our Galaxy’s spiral arms will eventually disappear and be replaced by others. The astronomers determined that a group of about a hundred stars are orbiting the centre of our Galaxy twenty kilometres per second faster than the Sun and other neighbouring stars. The stars trail behind the Galaxy’s Perseus Arm and the added velocity is likely caused by the gravitational pull of the stars and gas concentrated in the arm. One model says that spiral arms are density waves that travel through the disk of a galaxy like waves on the surface of a pond; i.e. the stars do not move with the wave. As well, the waves retain their shape as they travel around the galaxy. The second, referred to as the co-rotational model, says that spiral arms are made of stars and that the stars and the wave move around the galaxy together. They are analogous to the arms of a pirouetting figure skater. Probability argues that Hunt’s result is evidence for the co-rotational model. In the co-rotational model, there would be stars trailing the arm along its entire length, travelling faster than their neighbors along the entire length of the arm. On the other hand, in the density-wave model, stars in the wake of a spiral arm would be travelling faster than their neighbours in only one location along the entire arm. At other locations along the arm, trailing stars would be travelling faster or slower than the arm. So the odds are small that Hunt and his colleagues found this single, isolated population of stars. Hunt and his collaborators made their discovery using data from the European Space Agency’s Gaia spacecraft. 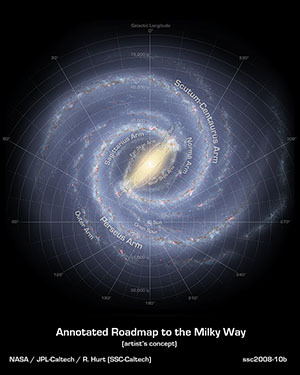 Gaia’s mission is to create a 3-dimensional map of our Galaxy and the data released so far includes distances, positions in the sky, and motion across the sky for around two million stars. While the current result is intriguing, Hunt and his collaborators await the second release of Gaia data containing the same information for over a billion stars. “With the current data we can only examine a very small part of the spiral arm,” says Hunt, “and we can’t be certain of our findings. 1. The group of stars is located at 180° Galactic longitude—i.e. directly opposite the Milky Way Galaxy’s centre, relative to us. Stars with fast Galactic rotation observe in Gaia TGAS: a signature driven by the Perseus arm? The Dunlap Institute for Astronomy & Astrophysics at the University of Toronto is an endowed research institute with over 40 faculty, postdocs, students and staff, dedicated to innovative technology, ground-breaking research, world-class training, and public engagement. The research themes of its faculty and Dunlap Fellows span the Universe and include: optical, infrared and radio instrumentation; Dark Energy; large-scale structure; the Cosmic Microwave Background; the interstellar medium; galaxy evolution; cosmic magnetism; and time-domain science.